An album starting with nature, birds, reminds me of our hero from Sealand, Broeder Dieleman. Octave Lissner has musically nothing to do with the enigmatic and somewhat esoteric Broeder Dieleman. Octave Lissner is as smooth as silk musically. Comparing the two artists is something like an oxymoron. Octave Lissner is a young man from Paris, France who seems to have digested over 50 years of pop music and comes up with all the right notes that lead to instant pleasure for the ear. In nothing I would have guessed having to do with a French artist. His English is well (sung), the music is U.S. influenced. From the 'What A Fool Believes' The Doobie Brothers to Michael McDonald's 'Sweet Freedom' or Marvin Gaye soul, it all found a way to Wildflower. More modern music lovers may like Paolo Nutini as a reference and those in between should imagine Oasis' 'Don't Look Back In Anger' infused with a load of soul. Enter L.A. songwriter Patrick Joseph. All that would be more of a disincentive to listen perhaps than a qualification to do so. I find that Octave Lissner often does the totally right thing, giving his music enough of a self to be enjoyed without having to compare the whole time. Yes, there are influences. Very obvious ones. It's of no consequence to the whole. What Lissner does with them is what makes Wildflower a pleasant experience. What I could hold against it is that the album is ever so smooth. There is no danger in Wildflower. But then, who said music needs to be dangerous? We have enough of that around. Octave Lissner aims at a listening experience and succeeds. Like the aforementioned Patrick Joseph he manages to couple more or less straightforward songs to interesting arrangements. The many little details in the songs, like a piano or extra guitar bursting through the fabric of the song, make it so fine. Or the harmony singing in 'Waves Of Time'. A detail that lifts the song up and caresses it like the waves out on the sea. 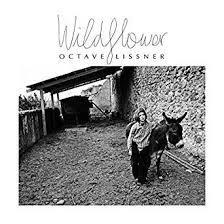 Octave Lissner has released a fine debut mini album consisting of eight songs. The songs take the listener through a few moods and tempi. Wildflower is a fine introduction to a new French songwriter who is in nothing what I associate with French music. If someone had told me this production came out of LA I would not have given it a single thought. What a fine experience Wildflower is.